BUSTED! Cops ticket the least threatening person in the park they can find: a young mom pushing a stroller and attending a French bulldog meetup. 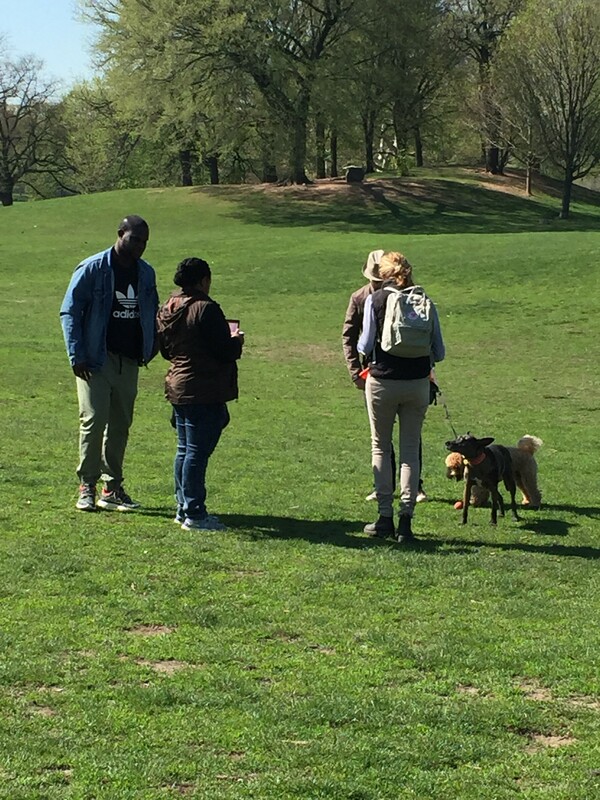 The City of New York executed a daring undercover raid on a menacing group of French bulldog owners meeting in Prospect Park’s Long Meadow on a recent Saturday morning. 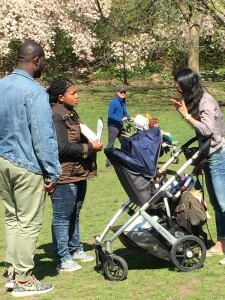 Their crime: having their miniature dogs off leash past the 9 a.m. curfew in a park obsessed with the enforcement of dog rules.The City of New York executed a daring undercover raid on a menacing group of French bulldog owners meeting in Prospect Park’s Long Meadow on a recent Saturday morning. Their crime: having their miniature dogs off leash past the 9 a.m. curfew in a park obsessed with the enforcement of dog rules. Swooping in dressed as a civilian couple–with the female officer slyly wearing acid-washed pre-torn jeans, the cops nabbed their prey: two moms whose tiny, friendly dogs sat nearby off-leash. One woman, ticketed before 10 am, left crying with a $200 ticket and her miniature poodle mix. The other walked off pushing a stroller explaining how the officers (either NYPD or Parks Enforcement Police, I’m not sure) told her that her dog was a danger to children. In typical racial profiling you see white cops harassing young, black men for just somehow seem menacing. But in this new twist, two young black cops seemingly singled out the whitest (on in one case Asian-Americanist), girliest, mildest people in the park. But it fits with what women (and milder dads) have long complained about: cops and parks enforcement go for the low-hanging fruit, the easy targets who are not bothering anyone but are easy to catch. Prospect Park management for some reason likes to use a show of force with dog people and no one else. Cops are there by 9:02 most days, flashing their lights and sirens. Enforcement is in inverse proportion to the number of other people enjoying the park. On cold winter weekday when not another living creature can be seen, I am sure to get scolded for having dropped the leash for my beagles, sitting in the snow five feet away. The people most upset about dogs off-leash in the park, who claim, without much evidence that dogs are rampaging through the woods (where dogs are never supposed to be off-leash) and scaring away birds. If there are so many dogs frolicking in the forest, it should be no problem to ticket them. But that would take actual police work, sitting in the woods all day hoping a dog will scamper by. So it’s easy to run by the meadow and trap the people who are trying to follow the rules, but are sloppy about it. (Like these other moms, I struggle, usually unsuccessfully, to get myself, my kid and my dogs to the park with enough time to play before 9. And if my husband is along, it is hopeless.) Sometimes dog people get tired of being harassed and just head from the meadow into the woods or Rose Garden, where manner of illegal activity is shielded from police by some kind of invisible forcefield. There is no shortage of behavioral or physical problems that need attention in the park. Although it’s supposed to happen, I have yet to see any of the pelotons of bike racers get tickets for blowing a red light. Just a few days before this incident I used the traffic signal button to cross the main drive with my stroller, kid and beagles. A bike racer ran a red light, yelled “You could have stopped for me!”, swerved menacingly behind me into the pedestrian path when I dared to use the button to turn the light red at a crosswalk. And right behind him was a car with Urban Park Rangers, who did absolutely nothing. 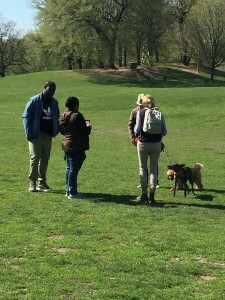 Brave Urban Park Rangers bust a toy poodle mix for violating the hours of off-leash dog-walking in Prospect Park. THEY HATE US CUZ THEY AIN’T US! FRENCHIE POWER!